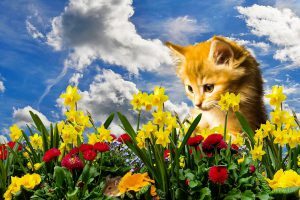 Having a Happy Easter With Cats is easy, however, there are some precautions that are necessary so everyone can enjoy the holiday rather than being at the vet office. Seasonal decorations, foods and plants are the cats biggest threat. Here are some examples. Some of this post is a reprint from my post Toxic Plants for Cats written on April 03, 2018. 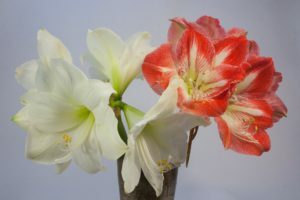 Easter Plants such as the Easter Lilly are extremely TOXIC to cats. Every part of this plant is toxic even the pollen. This plant will cause kidney failure and survivability rates are low even with immediate medical care. 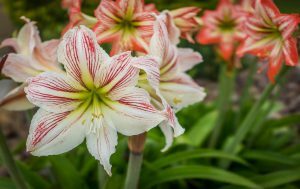 The Lilly’s that are of the greatest interest to the cat owner are the Easter Lilly, Asiatic Lily and Tiger Lily plus day Lily. Calla or Arum Lily contain crystals that irritate the mouth and cause drooling, diarrhea and vomiting but do not affect the kidneys. Lily of the Valley will affect the heart causing low blood pressure and an irregular heartbeat. This could progress to coma or seizures. To prevent all problems with Lilys just don’t bring them into the house. Here is a list of Non-Pet Friendly plants. Norfolk Pine, House Pine, Croton, Jade Plant, Dwarf Rubber Plant, Azalea, Geranium, Aloe, Dracaena, Corn Plant, Ribbon Plant, Dieffenbachia, Giant Dumb Cane, Daffodil, Paper White, Calla Lily, Trumpet Lily, Yucca, Caladium, Elephant Ears, Cutleaf Philodendron, Hurricane Plant, Golden Pothos, Devils Ivy, English Holy, Amaryllis, Belladonna Lily, Tulip & Tulip Bulb, Peace Lily, Horsehead, Heartleaf Philodendron, Chrysanthemum, Daisy, Mum, English Ivy, Sweetheart Ivy, Snake Plant, Mother-In-Law’s Tongue, Anthurium. It is a good idea to Google search every plant a person brings into the house to check for animal toxicity. A person should be cautious with outside plants too. Should your cat have roaming outside privileges your garden should be as free from toxic plants as the house. Please follow this link to my post Toxic Plants For Cats for a list of safe plants for your home. A good alternative to your cats chewing the houseplants is to plant Cat Grass for them. It is easy with seed from the pet store or purchase this example from Amazon. My cats love the grass and chew on it all day long. It takes about 3 days to sprout and within the week it is tall enough to eat. Regardless of the holiday, most duties of any special day fall on the mummies of the house. It is nice if the chef gets enough help to prevent accidents and injury to anyone. 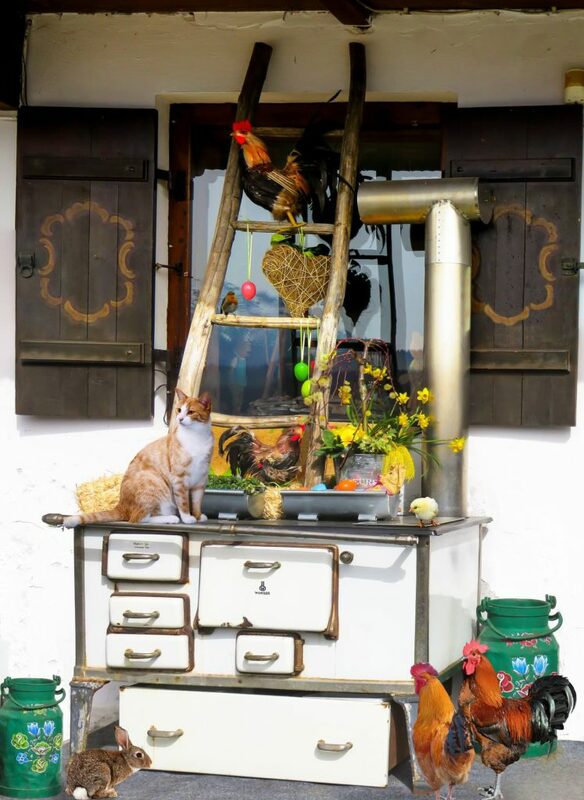 Our cats enjoy everything in the kitchen especially the smell of food or just watching and participating by just standing on the cupboard or stove. Whenever anything comes off the stove and the elements are hot I always put a pot of cold water on the empty element to prevent burnt feet. Sharp objects like knives should be stored to prevent being pushed off the cupboard. I never store sharp objects with the sharp side up as cats walk around the whole house when we are not looking. Because our cats are always underfoot please be careful not to get tripped by your nosey kitty. All the great cuisine we humans get to enjoy are not good for our cats or our dogs. Foods to avoid for your pets are chocolate, tea, coffee, grapes and raisins. Uncooked yeast dough can be fatal. Any raw meat should be avoided because of salmonellosis. This is a symptomatic infection caused by bacteria of the salmonella type. Do not let cats munch on onions in any form. An ingredient called thiosulphate contained in onions which are toxic to cats and dogs. 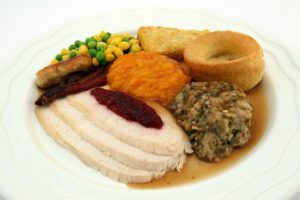 Cooked turkey and other poultry is not a problem for cats unless it is too hot. 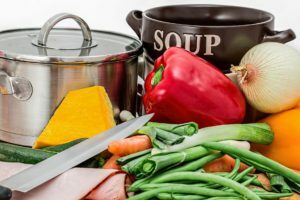 The spices and bastings applied to a cooking poultry product can give your kitty an upset stomach. One of the hazards of cooked poultry is that cooked bones if eaten will splinter and pierce your cat’s insides. Meat wrappings such as plastic, aluminum foil will be licked and ingested by cats with disastrous results. Meat soaked string is a lethal hazard to your cat. Should your cat eat string don’t pull it regardless of which end of the cat it is sticking out of. The string will tangle around their tongues and intestines and will require surgery to remove. Because of the serious damage string can cause I never leave any string, thread or yarn lying around. Take your time, get some help and spent time enjoying your day rather than sweating at the vet. In closing this topic I must mention that the most common cause of home fires is unattended cooking. If you need a rest shut off the top of the stove. When receiving guests I would recommend putting coats and other clothes in a closed room so that your kitty does not pee on the scents of other animals. It would be a good idea to set ground rules on the handling of your cats especially if there are undisciplined children present. I always feed my cats and dogs before the guests arrive so they are not tempted to hang around the table. Many pets are given during holiday seasons and then many pets are abandoned because the people involved were not prepared for receiving a pet. Cats, dogs and bunnies are abandoned to often. If you want to give a pet to someone have a sit-down and explain the responsibilities of owning a pet with children and parents before giving an animal to anyone. A cat is a lifetime commitment! 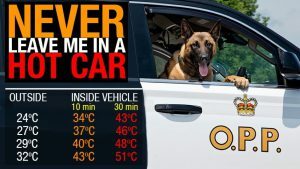 During this time of year as the outside temperatures climb we must remember that animals, babies and seniors must not be left in cars or hot rooms. The following chart will show how hot it gets inside a car. To experience this I suggest going to a parking lot, roll up the windows and shut the car off and see how long you can sit there. That’s my story for today. Be careful this holiday season and enjoy yourself by taking your time and getting help as necessary. Making your home safe for everyone including our furry family is important. Remember that no internet advice is better than the advice of your trusted vet. If you have a moment please have a look at my Cat Care Products page for something for that special kitty. Do you need good veterinary services in Manitoba. Rolling Plains Veterinary Consultants Inc.